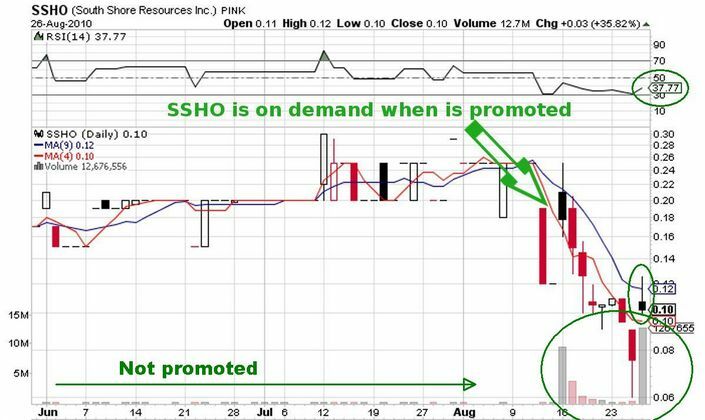 South Shore Resources, Inc. (PINK:SSHO, SSHO message board) stock has almost proven that it is demanded only when the $5K stock promo engine works. Yesterday, the information about the next series of SSHO stock promotions was disclosed. The first SSHO stock promotional wave was last Monday. One promoter succeeded to spark the fire of investor hopes for gains, which resulted in the highest for the company's trading history 9,4 million share turnover. Then, SSHO stock made a brilliant price performance, surging 47.50% up. And this was only the beginning. For the good start the company paid a compensation of 5 thousand dollars. These days, as follow up activities to stimulate SSHO stock demand, additional horsepower was added to the stock promotional machine. Four stock promoters, compensated by $5K each, succeeded again to fuel the fire of investor hopes. During yesterday's trading session 12.7 million shares changed hands, while the average volume for the company is only 952K. Being in a promotional euphoria, SSHO added 35.82% to its price from the previous day. Since the time of the first promo series, the company had not announced any news. There were no SEC filings as well, due to certain reasons explained in our article from last week. The chart here shows one really interesting fact. Two black candlesticks, drawn by investors in the days of the SSHO stock promotions, are presenting investors' uncertainty towards SSHO. During the session yesterday, although the share price jumped up from the previous day, SSHO pulled back 5.11%. The huge volume traded during these two weeks confirms that SSHO is demanded almost only when the $5K stock promotional engines are working. The conclusion from the analysis of SSHO stock performance is related to the profits and losses of investors. Since last Monday, without counting the company's HyProStar press releases in support of the shares' promotional euphoria, SSHO stock has lost 42.37% of its value. Maybe, the continuing input of the stock promoters in the coming days will change the above mentioned loss into a gain.